Rare machine cancellations - what happened during the first days of 1940? The slogan texts in the 3rd Generation machine cancellations were in Latvian language indicating that this method of publicity was intended for domestic mail but only occasionally on foreign mail. One exception is the slogan in M-30-A which in the French and German languages. This one was used on foreign mail in order to attract foreign tourists on their way to the, later cancelled, 12th Olympic Games in Finland 1940. However, also domestic mail with this cancellation is sometimes found. Known dates of use for this Olympic slogan cancellation with the index letter "A" is 20.08.1939 - 02.04.1940. 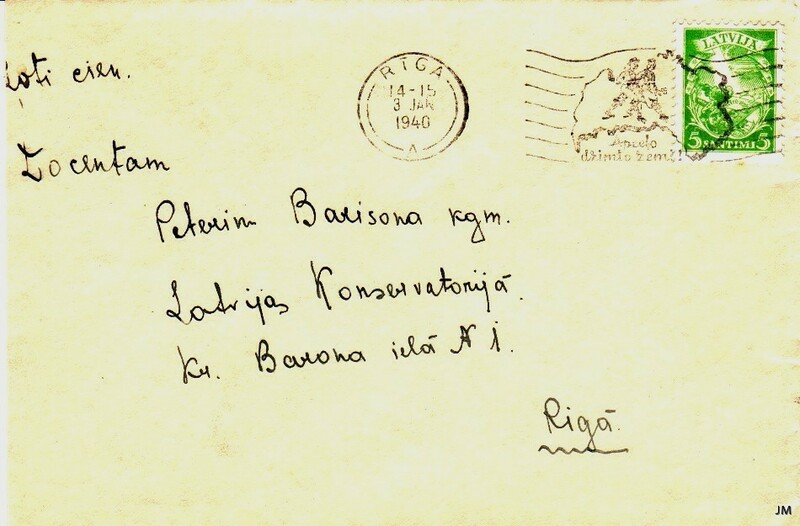 Almost simultaneously (29.08.1939 – 10.01.1940) the cancellation M-35-B (with index letter "B") was in use, showing a walking couple on the map of Latvia and the text "Tour your native country". During the 4 days 02.01.1940 - 05.01.1940 there are no such cancellations found. Instead the "Map" cancellation with index "A" and the "Olympic" cancellation with index "B" appeared. The existence of the "Olympic" cancellation with the index "B" has only been known since the last 1990ies. You can only speculate about what happened during these days in the beginning of 1940. It is believable that, by mistake of the postal authorities, there was an exchange of the circular date stamps by the changing of the year from 1939 to 1940. It took then 4 - 5 days until this mistake was discovered. One example of the "Olympic" cancellation with the index "B" is found with the date 05.01.1940 and with the denotation of time early in the morning (8 – 9) this day (see the item to the right). Mr. Lehr in Germany made a survey among Latvian philatelists regarding the date stamps of cancellations M-30-A and M-31-A. 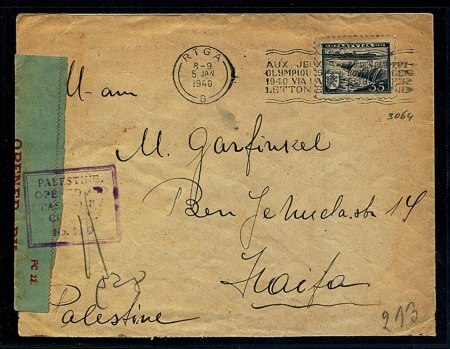 He found in the collection of Mr. Watzke (Germany) one cover with the M-30-A cancellation dated on January 5, 1940 showing the time 18 - 19. The lot No. 1398 in Mr. Kraul's "Baltikum-Auktionen" (03.98) shows a cancellation M-31-A with the time 14 - 15. Furthermore, Mr. Jānis Kankars in Riga now has announced the M-35-B cancellation from January 5 with the time insert 14 – 15. Of this we can figure out the exact time (14 – 15) on January 5, 1940 when the "Map" cancellation was switched from index "A" to "B". The error with the circular date stamp was found out and the original status was renewed. The two cancellations M-31-A and M-36-B on envelopes or cards must be seen as very rare items!